IMAGINE your two-year-old toddler saying a heartfelt “thank you” for your help; setting a table for lunch; rushing to help wipe up a friend’s water spill; sweeping the floor at the end of the day; and modeling for his younger friends how to use the toilet successfully. Imagine your spirited toddler able to concentrate on a task, able to wait patiently for her turn with the puzzle, and walking around her friend’s work rather than trampling all over it. Imagine a community of toddlers who truly enjoy each other’s company and care about their friends’ daily ups and downs. These are common scenes to be found in a Montessori Toddler Community, and Many Rivers Montessori is proud to provide the only such community for 16-month-olds through 3-year-olds in the Twin Ports. The Many Rivers Montessori program for toddlers is a nurturing and developmentally-responsive alternative to traditional childcare. The goal of Many Rivers Montessori’s Toddler Community is to provide a home-like, loving environment where children’s abilities and needs are respected and met. “Help me to help myself” is the mantra of the growing toddler, and MRM's teachers closely observe your child in order to best meet this need. The classroom is capped at 14 students, ten full day and four half-day. Over the course of one or two years, these children grow together into a close-knit, caring community. As required by the Association Montessori Internationale, there are two adults (Guide and assistant) in the environment at all times, with additional staff assisting at mealtime and transitions. MRM's Toddler program meets Monday–Friday from 8:30 a.m. to 3:30 p.m (for full day children). Before- and aftercare is also available. The program is designed to eliminate unnecessary transitions, allowing children to remain in the same familiar and protected setting, with the same teachers, during the school day. Research indicates that these transitions are very difficult for very young children, who require consistency and order in their day. The children who enroll in our Toddler Community program will find that it is an extension of their home environment. After the two-hour morning cycle, the children may play outside in the beautiful outdoor environment created especially for them. They have a lunch which encompasses family rituals; the children share responsibility for setting the table and for cleaning up after meals. After lunch, toddlers are given the opportunity to nap or rest. The afternoon portion of the day also provides opportunities for outside play and care of the outdoor environment. The MRM Toddler program is recognized by the Association Montessori Internationale (AMI) as meeting its stringent accreditation requirements. Note: New Toddler students follow an alternative schedule for the first week of school. Follow this link for a description. The Toddler classroom is a multi-aged environment, with older toddlers serving as role models and mentors for the younger ones. The room is thoughtfully designed to facilitate a toddler’s functional independence and to give him the freedom to move, and is set up with all the materials according to the standards of the Association Montessori Internationale (AMI). Depending on the age of enrollment and development of the child, toddlers stay in the program for one or two years. Many Rivers Montessori supports parents through a Montessori-based toilet-learning process. When toddlers are independently toileting, able to complete a full cycle of work, communicating well, and are socially ready, they generally transition into the Primary classroom around age 3. Young children have their own “sensitive periods” for learning. 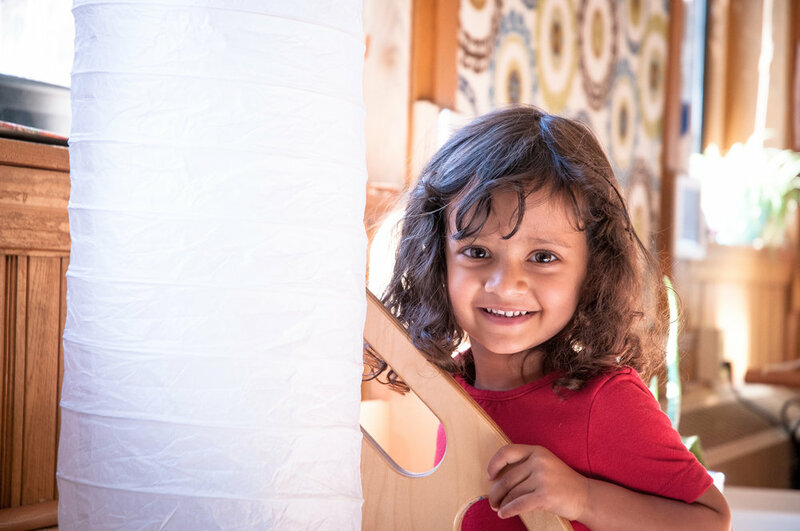 Maria Montessori recognized the need, during these periods, for a rich, well-prepared environment that provides a child with what she needs to gain independence, functional skills, knowledge, and to construct her self. In a Montessori Toddler classroom, children may work on pushing a cart or stringing beads, refining gross and fine motor development. In the area of practical life, they may work on preparing and serving a snack, or scrubbing a table. On any given day, children may be using language materials to learn to name different parts of the body, or identify a variety of insect life. Montessori toddlers also learn the rules of grace and courtesy, to treat each other with compassion, and to resolve conflicts peacefully. Growing daily in security, confidence and independence, Montessori toddlers experience a smoother transition into the Primary classroom when they are ready. The Montessori approach to toilet learning is an important part of the Toddler Community. Around 16–18 months, children enter a sensitive period in which they can most easily gain control of their now much more developed and integrated nervous system. At this stage most children have both the physical ability and the interest to control bladder and bowel. If they are given the opportunity to spend as much time as possible in underpants, rather than diapers, they gain a greater awareness of these bodily functions. Therefore, the children wear cotton underpants (also known as “training pants”) while they are in the classroom. Parents are encouraged to follow through at home so that their children have consistency in both environments. The Toddler Community environment is divided into many different areas that provide interesting, purposeful activities. The beautiful materials attract the child's interest and fulfill the child's natural urge to explore the world. Gradually, the child lengthens his span of concentration. The materials also assist the child to refine eye-hand coordination. Children are encouraged to experiment with paint, clay, glue and crayons. Language activities are also very important in our AMI toddler program, as the young child is in the most sensitive period for acquiring language. The child's language is enriched through conversation, songs, poems and stories as well as beautiful materials and presentations that help enhance vocabulary and allow for both receptive and expressive language development. Toddlers at Many Rivers Montessori are also offered a group Spanish lesson twice a week. Each day some of the children assist in the preparation of a nutritious snack while others help in the setting of a beautiful table. The children and adults gather together each day for a "family style" meal. The children also assist in cleaning up and taking care of the environment. A safe, child-sized, prepared environment that encourages independence. For example, children drink from open glasses, pour from a pitcher, serve themselves, and learn to use silverware. Children take off and put on their own shoes and clothing, learn to use the toilet, put away their own work, and help clean up after a meal. A quiet environment that allows a child to focus. Teachers use soft voices and respect the child’s concentration, and children learn to respect each other’s concentration. Respect for the child. We respect the child by telling her what we are going to do before doing it, for example, when changing a child’s wet pants; by allowing the child to choose his activities (“works”) in the classroom; and by honoring their strong feelings with compassion and guidance. Consistent modeling of Grace and Courtesy. Our teachers speak politely to the children and each other throughout the day, inviting children into this way of living as a community.